The Evangelical Lutheran Mission Diocese of Finland was founded when the representatives of the congregations signed the founding document. It describes shortly the reasons that were behind founding of the Diocese. At the same time it publicly states the confession of the Diocese and calls for others to join in the work of renewing Lutheran congregational life in Finland. The purpose, structure and operative rules of The Evangelical Lutheran Mission Diocese of Finland are described in the Diocesan Order. In part one it describes the confession, nature and mission of the Diocese. Part two describes the different administrative bodies of the Diocese with their duties. Rules and regulations guiding the activities of the Diocese are described in part three. The coat of arms depicts a golden background and a red cup with an octagonal thickening in its stand. 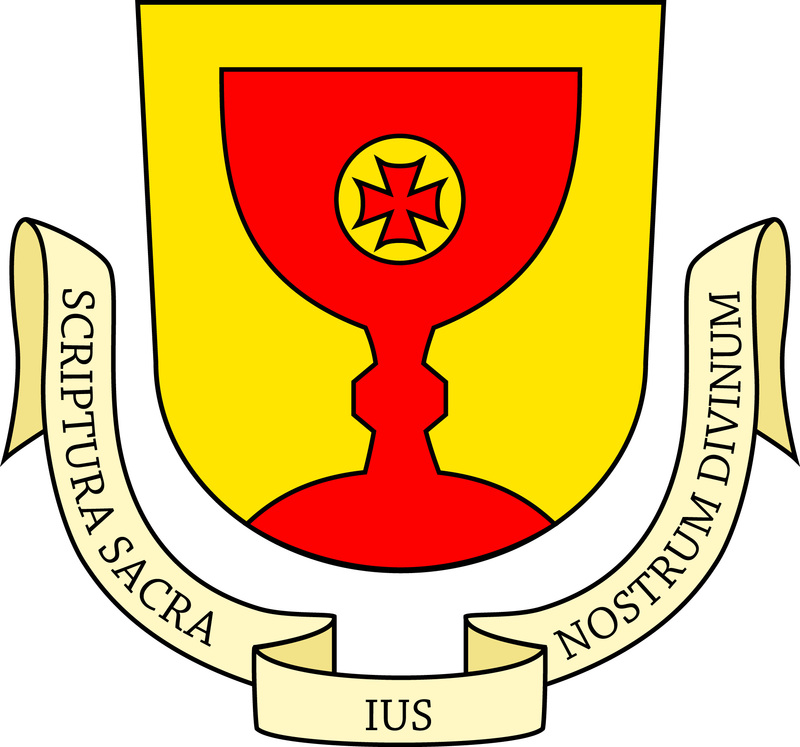 The cup may be seen as a chalice that has one one side a golden host stamped with a red St George’s Cross with concave tips. On the other hand, the cup may be seen as a baptismal font. At baptism, the baptised are blessed with the holy sign of the cross. 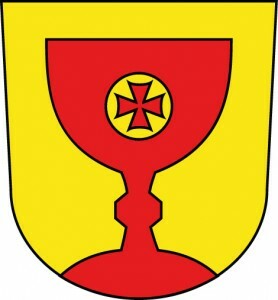 The Bishop’s coat of arms depicts a golden background and a red cup with an octagonal thickening in its stand. 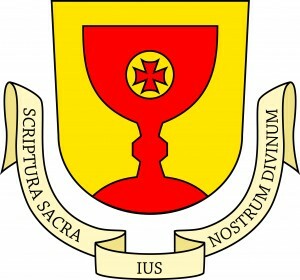 The cup may be seen as a chalice that has one one side a golden host stamped with a red St George’s Cross with concave tips. On the other hand, the cup may be seen as a baptismal font. At baptism, the baptised are blessed with the holy sign of the cross. Above the coat of arms is a mitre (Bishop’s hat). 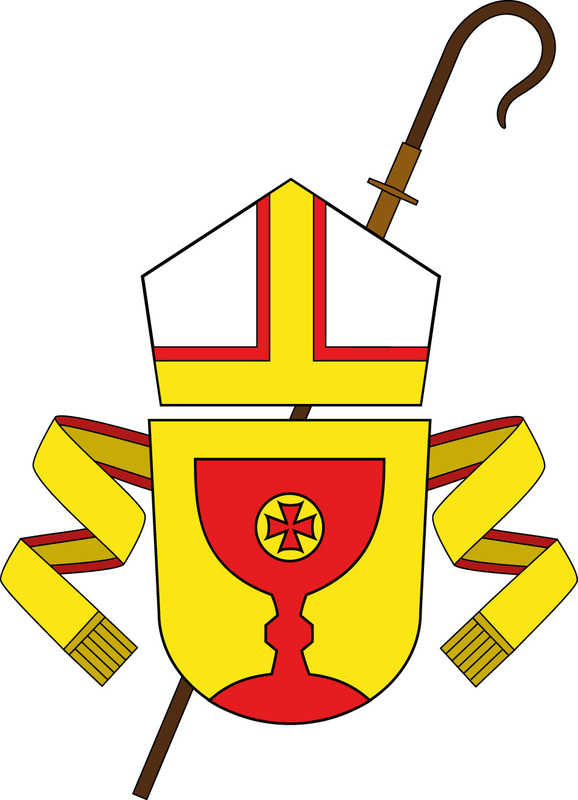 In the background of the coat of arms is a diagonally placed crosier (Bishop’s staff). On its top part of the staff is an octagonal ornament reminding of the eight beatitudes that Jesus stated in his sermon on the mount.